Step back into the Upside Down! From Season 2 of the Netflix series, Stranger Things , the residents of Hawkins are back in the Pop! Vinyl figure format. This Stranger Things Max with Skateboard Pop! Vinyl Figure #551 measures approximately 3 3/4-inches tall and comes packaged in a window display box. Ages 3 and up. Funko,Stranger Things,Pop! Vinyl Figures,Step back into the Upside Down! From Season 2 of the Netflix series, Stranger Things , the residents of Hawkins are back in the Pop! Vinyl figure format. This Stranger Things Max with Skateboard Pop! Funko, Pop! Vinyl Figures, Step back into the Upside Down! From Season 2 of the Netflix series, Stranger Things, the residents of Hawkins are back in the Pop! Vinyl figure format. 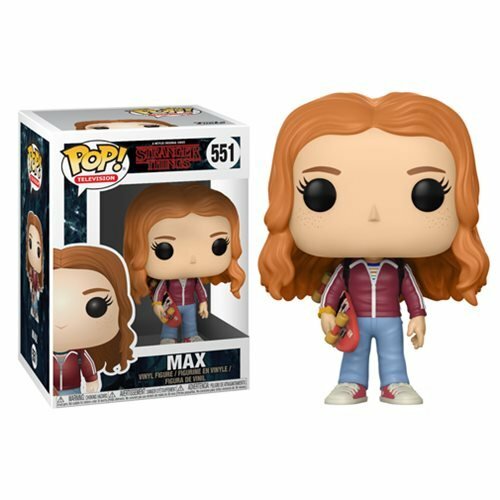 This Stranger Things Max with Skateboard Pop!